The Great Albini is a 5 reels and 25 Paylines video slot game powered by Foxium software platform. This is a video slot game which is playable at devices like mobile, smart phones as well as on desktop and tablets. Minimum coin size for the slot is 25p per spin while maximum can be 50 per spin. The slot offers a jackpot of 1000 times on your total stake and it has a Return of Player percentage of 96.66%, which is a decent RTP for this kind of game. The game features wild symbols, bonus symbols, scatter symbols, auto play option, Multiplier as well as Free spins. The Great Albini video slot is based on a magical theme and it has everything that a player likes to play in an online slot machine. The symbols of this slot floats over a wooden stage where a number of lamps are hanging overhead and they look very pretty during gaming. The Great Albini symbol is the highest paying symbol as well. The game also includes other symbols like a yellow bird, a knife-throwers target and 10, J, Q, K and A cards but these are low value symbols. The word ‘Wild’ is the wild symbol here and will appear on middle 3 reels i.e. from 2 to 5. The wild when appears can replace all other symbols on your screen except the Free Spins bonus, Mystery Box and Lily Wild. If you land 3 or more of the scatter symbols then you will trigger the Free Spin feature and in that case the playing grid will increase to 5×6 and the number of Paylines will be doubled to 50. 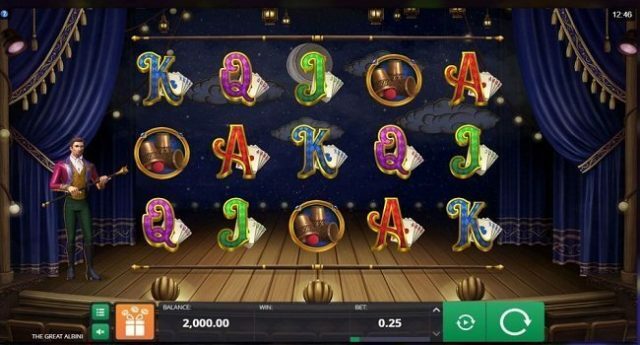 You would also receive 12 free spins if getting 3 scatters on your Payline. You can also buy 8,10 or 12 spins if you are impatient using the orange button and in that case any winning will give you 100x, 125x or 150 times on your total during. If you land Lily on reel 2, 3 or 4 then it will trigger Lily Wild feature and 2x multiplier. You will also get free respin until there are no any wins. When you land a full stack of Mystery boxes on reel 3 then three respins will be awarded to you.